For other monarchs with similar names, see John of Poland (disambiguation). For his descendant, see John Sobieski (U.S. Colonel). John III Sobieski (Polish: Jan III Sobieski; Lithuanian: Jonas III Sobieskis; Latin: Ioannes III Sobiscius; 17 August 1629 – 17 June 1696) was King of Poland and Grand Duke of Lithuania from 1674 until his death, and one of the most notable monarchs of the Polish–Lithuanian Commonwealth. Sobieski's military skill, demonstrated in combating the invasions of the Ottoman Empire, contributed to his prowess as King of Poland. Sobieski's 22-year reign marked a period of the Commonwealth's stabilization, much needed after the turmoil of the Deluge and the Khmelnytsky Uprising. Popular among his subjects, he was an able military commander, most famous for his victory over the Turks at the 1683 Battle of Vienna. After his victories over them, the Ottomans called him the "Lion of Lechistan"; and the Pope hailed him as the savior of Christendom. Official title (in Latin): Joannes III, Dei Gratia rex Poloniae, magnus dux Lithuaniae, Russiae, Prussiae, Masoviae, Samogitiae, Livoniae, Smolenscie, Kijoviae, Volhyniae, Podlachiae, Severiae, Czernichoviaeque, etc. Official title (in Polish): Jan III, z łaski bożej, król Polski, wielki książę litewski, ruski, pruski, mazowiecki, żmudzki, kijowski, wołyński, podlaski i czernichowski, etc. English translation: John III, by the grace of God King of Poland, Grand Duke of Lithuania, Ruthenia, Prussia, Masovia, Samogitia, Livonia, Smolensk, Kiev, Volhynia, Podlasie, Severia, and Chernihiv, etc. John Sobieski was born on 17 August 1629, in Olesko, now Ukraine, then part of the Ruthenian Voivodeship in the Crown of the Kingdom of Poland, Polish–Lithuanian Commonwealth to a renowned noble family de Sobieszyn Sobieski of Janina coat of arms. His father, Jakub Sobieski, was the Voivode of Ruthenia and Castellan of Kraków; his mother, Zofia Teofillia Daniłowicz was a granddaughter of Hetman Stanisław Żółkiewski. John Sobieski spent his childhood in Żółkiew. After graduating from the Nowodworski College in Kraków in 1643, young John Sobieski then graduated from the philosophical faculty of the Jagiellonian University in 1646. After finishing his studies, John and his brother Marek Sobieski left for western Europe, where he spent more than two years travelling. They visited Leipzig, Antwerp, Paris, London, Leiden, and The Hague. During that time, he met influential contemporary figures such as Louis II de Bourbon, Charles II of England and William II, Prince of Orange, and learned French, German, and Italian, in addition to Latin. Both brothers returned to the Commonwealth in 1648. Upon receiving the news of the death of king Władysław IV Vasa and the hostilities of the Khmelnytsky Uprising, they volunteered for the army. They both fought in the siege of Zamość. They founded and commanded their own banners (chorągiew) of cavalry (one light, "cossack", and one heavy, of Polish hussars). Soon, the fortunes of war separated the brothers. In 1649, Jakub fought in the Battle of Zboriv. In 1652, Marek died in Tatar captivity after his capture at the Battle of Batih. John was promoted to the rank of pułkownik and fought with distinction in the Battle of Berestechko. A promising commander, John was sent by King John II Casimir as one of the envoys in the diplomatic mission of Mikołaj Bieganowski to the Ottoman Empire. There, Sobieski learned the Tatar language and the Turkish language and studied Turkish military traditions and tactics. It is likely he participated as part of the briefly allied Polish-Tatar forces in the 1655 Battle of Okhmativ. 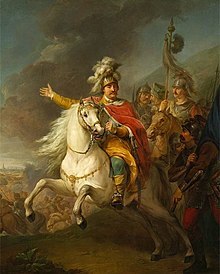 After the start of the Swedish invasion of Poland known as "The Deluge", John Sobieski was among the Greater Polish regiments led by Krzysztof Opaliński, Palatine of Poznań which capitulated at Ujście, and swore allegiance to King Charles X Gustav of Sweden. However, around late March 1656, he abandoned their side, returning to the side of Polish king John II Casimir Vasa, enlisting under the command of hetmans Stefan Czarniecki and Jerzy Sebastian Lubomirski. By 26 May 1656 he received the position of the chorąży koronny (Standard-bearer of the Crown). During the three-day-long battle of Warsaw of 1656, Sobieski commanded a 2,000-man strong regiment of Tatar cavalry. He took part in a number of engagements over the next two years, including the Siege of Toruń in 1658. In 1659 he was elected a deputy to the Sejm (Polish-Lithuanian parliament), and was one of the Polish negotiators of the Treaty of Hadiach with the Cossacks. In 1660 he took part in the last offensive against the Swedes in Prussia, and was rewarded with the office of starost of Stryj. Soon afterward he took part in the war against the Russians, participating in the Battle of Slobodyshche and Battle of Lyubar, and later that year he again was one of the negotiators of a new treaty with the Cossacks (the Treaty of Cudnów). Through personal connections, he became a strong supporter of the French faction in the Polish royal court, represented by Queen Marie Louise Gonzaga. His pro-French allegiance was reinforced in 1665, when he married Marie Casimire Louise de la Grange d'Arquien and was promoted to the rank of Grand Marshal of the Crown. In 1662 he was again elected a deputy to the Sejm, and took part in the work on reforming the military. He was also a member of the Sejm in 1664 and 1665. In between he participated in the Russian campaign of 1663. Sobieski remained loyal to the King during the Lubomirski Rebellion of 1665–66, though it was a difficult decision for him. He participated in the Sejm of 1665, and after some delays, accepted the prestigious office of the Marshal of the Crown on 18 May that year. Around late April or early May 1666 he received another high office of the Commonwealth, that of the Field Crown Hetman. Soon afterward, he was defeated at the Battle of Mątwy, and signed the Agreement of Łęgonice on the 21 July, which ended the Lubomirski Rebellion. In October 1667 he achieved another victory over the Cossacks of Petro Doroshenko and their Crimean Tatar allies in the Battle of Podhajce during the Polish–Cossack–Tatar War (1666–71). This allowed him to regain his image as a skilled military leader. Later that year, in November, his first child, James Louis Sobieski was born in Paris. 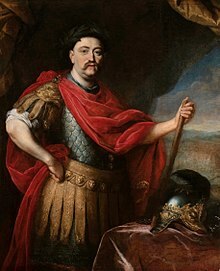 On 5 February 1668 he achieved the rank of Grand Hetman of the Crown, the highest military rank in the Polish–Lithuanian Commonwealth, and thereby the de facto commander-in-chief of the entire Polish Army. Later that year he supported the French candidacy of Louis, Grand Condé for the Polish throne, and after this candidacy fell apart, Philip William, Elector Palatine. Following the election of Michał Korybut Wiśniowiecki he joined the opposition faction; he and his allies helped veto several sejms (including the coronation ones), and his attitude once again resulted in him losing popularity among the regular szlachta. While his pro-French stance in politics alienated some, his military victories against invading Tatars in 1671 helped him gain other allies. The year 1672 saw internal politics destabilizing the Commonwealth, as the pro-French faction of Sobieski and pro-court faction of King Michał formed two confederations, which despite major Ottoman incursions in the south seemed more concerned with one another than with uniting to defend the country. The court faction called openly for confiscation of his estates and dismissal from office, and declared him an "enemy of the state". This division culminated in the humiliating Treaty of Buchach, where the Commonwealth was forced to cede territories to the Ottomans, but promise an annual tribute. Sobieski eventually succeeded in balancing politics and national defense, and a combination of his military victories over the invaders, and successful negotiations at the Sejm in April 1673, led to a compromise in which the court faction dropped its demands and challenges against him. On 11 November 1673 Sobieski added a major victory to his list, this time defeating the Ottomans in the Battle of Khotyn and capturing the fortress located there. The news of the battle coincided with the death of King Michal the day before the battle. This made Sobieski one of the leading figures of the state, so on 19 May the following year, he was elected monarch of the Commonwealth. His candidacy was almost universally supported, with only a dozen or so members of the diet opposing him (mainly centered around magnates of the Lithuanian Pac family). In light of the war, requiring Sobieski to be on the front lines, the coronation ceremony was significantly delayed – he was crowned John III almost two years later, on 2 February 1676. Though Poland-Lithuania was at that time the largest and one of the most populous states of Europe, Sobieski became a king of a country devastated by almost half a century of constant war. The treasury was almost empty and the court had little to offer the powerful magnates, who often allied themselves with foreign courts rather than the state. Sobieski had a number of long term plans, including establishing his own dynasty in the Commonwealth, regaining lost territories, and strengthening the country through various reforms. One of his ambitions was to unify Christian Europe in a crusade to drive the Turks out of Europe. At the beginning of his reign, however, the Polish state was in dire fiscal straits and faced military threats to the north. King Louis XIV of France promised to mediate a truce between the Ottomans and Poland so that Sobieski could focus his attentions on Prussia. The negotiations ended in failure and Sobieski's Baltic goals had to be tempered by the immediate reality of the Ottoman threat to the south. In the autumn of 1674, he recommenced the war against the Ottomans and managed to recapture a number of cities and fortresses including Bratslav, Mogilev, and Bar, which re-established a strongly fortified line defending Poland's southern border in Ukraine. In 1675, Sobieski defeated a Turkish and Tatar offensive aiming at Lviv. In 1676, the Tatars began a counter-offensive and crossed the Dneper, but could not retake the strategic town of Żórawno, and a peace treaty (the Treaty of Żurawno) was signed soon afterwards. Although Kamieniec Podolski and much of Podolia remained a part of the Ottoman Empire, Poland gained the return of the towns of Bila Tserkva and Pavoloch. The treaty with the Ottomans began a period of peace that was much needed for the repair of the country and strengthening of the royal authority. Sobieski managed to reform the Polish army completely. The army was reorganised into regiments, the infantry finally dropped pikes, replacing them with battle-axes, and the Polish cavalry adopted hussar and dragoon formations. Sobieski also greatly increased the number of cannon and introduced new artillery tactics. Sobieski wanted to conquer Prussia with Swedish troops and French support. Regaining control of this autonomous province was in the Commonwealth's best interest, and Sobieski also hoped for it to become part of his family domain. To this end he made the secret Treaty of Jaworów (1675), but he achieved nothing. The wars with the Ottoman Empire were not decisively won by the Commonwealth, the ruler of Brandenburg-Prussia made treaties with France, Prussia defeated the Swedish invasion, and Sobieski's plans for the Commonwealth's own military campaign against Prussia was opposed by Commonwealth magnates, many of them taking the Prussian side. Backed by Brandenburg and Austria, internal enemies of Sobieski even planned to dethrone him and elect Charles of Lorraine. The French-Prussian treaty of 1678 meant that Sobieski lost the major foreign ally for his planned campaign against Prussia; consequently he started to distance himself from the pro-French faction, which in turn resulted in the cooling down of the Polish-French relations. During the Sejm of 1683, the French ambassador was expelled for involvement with a plan to dethrone Sobieski, definitely marking the end of the Polish-French alliance. At the same time Sobieski made peace with the pro-Habsburg faction and started to gravitate towards an alliance with Austria. This did not end the existence of strong internal opposition to Sobieski; however, it changed a number of allegiances, and further opposition was temporarily weakened through the king's successful political maneuvering, including granting the Grand Hetman office to one of the opposition's chief leaders, Stanisław Jan Jabłonowski. Conscious that Poland lacked allies and risked war against most of its neighbours (a situation similar to the Deluge), by 1683 Sobieski allied himself with Leopold I, of the Holy Roman Empire. Both sides promised to come to one's another aid if their capitals were threatened. The alliance was signed by royal representatives on 31 March 1683, and ratified by the Emperor and Polish parliament within weeks. Although aimed directly against the Ottomans and indirectly against France, it had the advantage of gaining internal support for the defense of Poland's southern borders. This was a beginning of what would become the Holy League, championed by Pope Innocent XI to preserve Christendom. Meantime, in the spring of 1683, royal spies uncovered Turkish preparations for a military campaign. Sobieski feared that the target might be the Polish cities of Lwów and Kraków. To counteract the threat, Sobieski began the fortification of the cities and ordered universal military conscription. In July, the Austrian envoy asked for Polish assistance. Soon afterward, the Polish army started massing for an expedition against the Ottomans, and in August was joined by Bavarians and Saxon allies under Charles of Lorraine. Sobieski's greatest success came in 1683, with his victory at the Battle of Vienna, in joint command of Polish and German troops, against the invading Ottoman Turks under Kara Mustafa. Upon reaching Vienna on 12 September, with the Ottoman army close to breaching the walls, Sobieski ordered a full attack. In the early morning, the united army of about 65,000–76,000 men (including 22,000,-27,000 Poles) attacked a Turkish force of about 143,000 men. At about 5 pm, after observing the infantry battle from the Kahlenberg hilltop, Sobieski led the Polish husaria cavalry along with Austrians and Germans in a massive charge down the hillside. Soon, the Ottoman battle line was broken and the Ottoman forces scattered in disarray. At 5:30 pm, Sobieski entered the deserted tent of Kara Mustafa and the Battle of Vienna ended. The Pope and other foreign dignitaries hailed Sobieski as the "Savior of Vienna and Western European civilization." In a letter to his wife, he wrote, "All the common people kissed my hands, my feet, my clothes; others only touched me, saying: 'Ah, let us kiss so valiant a hand!'" The war with the Ottomans was not yet over, and Sobieski continued the campaign with the Battle of Párkány on 7–9 October. After early victories, the Polish found themselves a junior partner in the Holy League, gaining no lasting territorial or political rewards. The prolonged and indecisive war also weakened Sobieski's position at home. For the next four years Poland would blockade the key fortress at Kamenets, and Ottoman Tatars would raid the borderlands. In 1691, Sobieski undertook another expedition to Moldavia, with slightly better results, but still with no decisive victories. Although the King spent much time on the battlefields, which could suggest a good state of health, towards the end of his life he became seriously and increasingly ill.
King John III Sobieski died in Wilanów, Poland on 17 June 1696 from a sudden heart attack. His wife, Marie Casimire Louise, died in 1716 in Blois, France, and her body was returned to Poland. They are interred together in Wawel Cathedral, Kraków, Poland. He was succeeded by Augustus II. 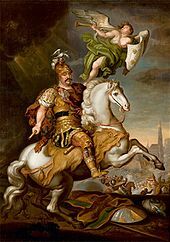 Sobieski is remembered in Poland as a "hero king", victor at Vienna who defeated the Ottoman threat, an image that became particularly well recognized after his story was told in many works of 19th century literature. In the Polski słownik biograficzny he is described as "an individual above his contemporaries, but still one of them"; an oligarch and a magnate, interested in personal wealth and power. His ambitions for the most part were instilled in him by his beloved wife, whom he undoubtedly loved more than any throne (when being forced to divorce her and marry the former Queen as a condition to gain the throne, he immediately refused the throne) and tended to obey, at times blindly. He failed to reform the ailing Commonwealth, and to secure the throne for his heir. At the same time, he displayed high military prowess, he was well educated and literate, and a patron of science and arts. He supported the astronomer Johannes Hevelius, mathematician Adam Adamandy Kochański and the historian and poet Wespazjan Kochowski. His Wilanów Palace became the first of many palaces that would dot the lands of the Commonwealth over the next two centuries. James Louis Sobieski (2 November 1667 – 19 December 1737), Crown Prince of Poland, married Countess Palatine Hedwig Elisabeth of Neuburg and had issue. Twin Daughters (9 May 1669), stillborn or died shortly after birth. Teresa Teofila (October 1670), was a frail child and failed to survive for more than a month. Adelajda Ludwika (15 October 1672 – 10 February 1677), called "Barbelune", died at the age of four. Maria Teresa (18 October 1673 – 7 December 1675), called "La Mannone", died at the age of two. Daughter (October 1674), stillborn or died shortly after birth. Teresa Kunegunda (4 March 1676 – 10 March 1730), married Maximilian II Emanuel, Elector of Bavaria and had issue. Aleksander Benedykt (6 September 1677 – 19 November 1714), died unmarried. Daughter (13 November 1678), stillborn or died shortly after birth. Konstanty Władysław (1 May 1680 – 28 February 1726), married Maria Józefa Wessel but had no issue. Jan (4 June 1682 – 1 January/12 April 1685), died at the age of two. Daughter (20 December 1684), stillborn or died shortly after birth. Anonymous portrait of James Louis, painted about 1685. Anonymous portrait of Teresa Kunegunda, painted at the end of the 17th century. Portrait of Aleksander Benedykt by the circle of Hyacinthe Rigaud, about 1696. Portrait of Konstanty Władysław by the circle of Hyacinthe Rigaud, about 1696. Anonymous portrait of Prince Jan (1682–1685), painted about 1683. Portrait of Maria Klementyna, John III's granddaughter, painted by Pier Leone Ghezzi around 1735. Anonymous portrait of Maria Karolina, John III's granddaughter, painted around 1730. Portrait of the Sobieski family by Siemiginowski-Eleuter. Left side: Jakub, Konstanty, Aleksander, Teresa. Right side: Marie Casimire holding Jan (1682–1685). Portrait of the Sobieski family by Henri Gascar. Left side: Konstanty and Jakub (grasping a portrait of John III). Right side: Aleksander, Teresa and Marie Casimire. Portrait of the Sobieski family by Henri Gascar. John III and Marie Casimire are in the middle; Konstanty, Aleksander and Jakub are on the left; Teresa Kunegunda and Hedwig of Neuburg holding her daughter Maria Leopoldyna (1693–1695) are on the right. John III Sobieski sometimes appears in the loading screen in the computer strategy game, Europa Universalis IV. When he turned to go back to the camp, he discovered that there was another man up on this hill, a stone’s throw away: some kind of monk or holy man, perhaps, as he was dressed in a rough sackcloth robe, with no finery. But then the bloke whipped out a sword. It was not one of your needle-thin rapiers, such as fops pushed at each other in the streets of London and Paris, but some kind of relic of the Crusades, a two-handed production with a single crossbar instead of a proper guard—the sort of thing Richard the Lionhearted might’ve used to slay camels in the streets of Jerusalem. This man went down on one knee in the dirt, and he did it with verve and enthusiasm. You see your rich man kneeling in church and it takes him two or three minutes, you can hear his knees popping and sinews creaking, he totters this way and that, creating small alarums amongst the servants who are gripping his elbows. But this brute knelt easily, even lustily if such a thing were possible, and facing toward the city of Vienna, he planted his sword in the ground so that it became a steel cross. The morning light was shining directly into his grizzled face and glinting from the steel of the blade and glowing in some indifferent colored jewels set into the weapon’s hilt and crossbar. The man bowed his head and took to mumbling in Latin. The hand that wasn’t holding the sword was thumbing through a rosary—Jack’s cue to exit stage right. But as he was leaving he recognized the man with the broadsword as King John Sobieski. —  Neal Stephenson, King of the Vagabonds, chapter "The Continent"
He appears in his pre-royalty status as a character in Mount & Blade: With Fire & Sword. Sobieski appears as a character in the historical novel Poland by James A. Michener in a chapter recounting the Battle of Vienna. ^ Aleksander Gieysztor (1979). History of Poland. PWN, Polish Scientific Publishers. p. 223. ISBN 83-01-00392-8. ^ J.A. Hammerton (2007). Peoples of All Nations: Their Life Today And Story Of Their Past. Concept Publishing Company. p. 4142. ISBN 81-7268-144-5. ^ Mario Reading (2009). The Complete Prophecies of Nostradamus. Sterling Publishing Company, Inc. p. 382. ISBN 1-906787-39-5. ^ Ignacy Zagórski, Edward Rastawiecki (baron) (1845). Monety dawnej polski jakoteż prowincyj i miast do niéj niegdy należacych: z trzech ostatnich wieków zebrane (in Polish). S.H. Merzbach. p. 75. ^ a b c d Wojciech Skalmowski; Tatjana Soldatjenkova; Emmanuel Waegemans (2003). Liber amicorum. Peeters Publishers. p. 165. ISBN 90-429-1298-7. ^ J.B. Morton. Sobieski, King of Poland. pp. 30–31. ^ Daniel Stone (2001). The Polish–Lithuanian state, 1386–1795. University of Washington Press. p. 236. ISBN 0-295-98093-1. ^ a b c d e f g h i Simon Millar; Peter Dennis (2008). Vienna 1683: Christian Europe Repels the Ottomans. Osprey Publishing. p. 17. ISBN 1-84603-231-8. ^ a b Frank N. Magill (13 September 2013). The 17th and 18th Centuries: Dictionary of World Biography. Routledge. p. 726. ISBN 978-1-135-92414-0. ^ Howard N. Lupovitch (16 December 2009). Jews and Judaism in World History. Routledge. p. 120. ISBN 978-1-135-18965-5. ^ Joseph Cummins. The War Chronicles: From Chariots to Flintlocks. Fair Winds. p. 323. ISBN 978-1-61673-403-9. ^ F. L. Carsten (1 January 1961). The New Cambridge Modern History: Volume 5, The Ascendancy of France, 1648–88. CUP Archive. p. 564. ISBN 978-0-521-04544-5. ^ a b c d e f Frank N. Magill (13 September 2013). The 17th and 18th Centuries: Dictionary of World Biography. Routledge. p. 727. ISBN 978-1-135-92414-0. ^ a b Oskar Halecki; W: F. Reddaway; J. H. Penson. The Cambridge History of Poland. CUP Archive. p. 538. ISBN 978-1-00-128802-4. ^ a b c Wiktor Waintraub (1976). Memoirs of the Polish Baroque: the writings of Jan Chryzostom Pasek, a squire of the Commonwealth of Poland and Lithuania. University of California Press. p. 308. ISBN 0-520-02752-3. ^ a b Oskar Halecki; W: F. Reddaway; J. H. Penson. The Cambridge History of Poland. CUP Archive. p. 542. ISBN 978-1-00-128802-4. ^ a b Mirosław Nagielski (1995). Hetmani Rzeczypospolitej Obojga Narodów (in Polish). Bellona. p. 227. ISBN 83-11-08275-8. ^ a b Oskar Halecki; W: F. Reddaway; J. H. Penson. The Cambridge History of Poland. CUP Archive. pp. 543–544. ISBN 978-1-00-128802-4. ^ Oskar Halecki; W: F. Reddaway; J. H. Penson. The Cambridge History of Poland. CUP Archive. p. 541. ISBN 978-1-00-128802-4. ^ a b c Kenneth Meyer Setton (1991). Venice, Austria, and the Turks in the Seventeenth Century. American Philosophical Society. pp. 266–269. ISBN 978-0-87169-192-7. ^ Oskar Halecki; W: F. Reddaway; J. H. Penson. The Cambridge History of Poland. CUP Archive. pp. 544–545. ISBN 978-1-00-128802-4. ^ a b c d e f Oskar Halecki; W: F. Reddaway; J. H. Penson. The Cambridge History of Poland. CUP Archive. pp. 547–548. ISBN 978-1-00-128802-4. ^ a b c Miltiades Varvounis (2012). JAN SOBIESKI. Xlibris Corporation. p. 189. ISBN 978-1-4628-8082-9. ^ Miltiades Varvounis (2012). JAN SOBIESKI. Xlibris Corporation. p. 195. ISBN 978-1-4628-8082-9. ^ World Book, Inc (2007). "Volume 1". The World Book Encyclopedia. Bellona. p. 132. ISBN 0-7166-0107-9. ^ Mizwa, Stephen Paul (1942). Great Men and Women of Poland. New York: Macmillan. p. 103. ^ FM., RMF. "Kto przewiózł trumnę Marysieńki Sobieskiej do Polski?". ^ Oskar Halecki; W: F. Reddaway; J. H. Penson. The Cambridge History of Poland. CUP Archive. p. 547. ISBN 978-1-00-128802-4. ^ de Battaglia, O.Forst. The Cambridge History of Poland. Cambridge University Press. p. 539. ISBN 9781001288024. ^ Drohojowska, Countess Antoinette Joséphine Françoise Anne; Salvandy, Achille (Count.) (1856). Love of Country, or Sobieski and Hedwig. Compiled and translated from the French (of N. A. de Salvandy, the Countess Drohojowska, etc.) by Trauermantel. Crosby, Nichols, and company. pp. 87–88. Wikimedia Commons has media related to John III of Poland. Herbermann, Charles, ed. (1913). "John Sobieski" . Catholic Encyclopedia. New York: Robert Appleton Company.